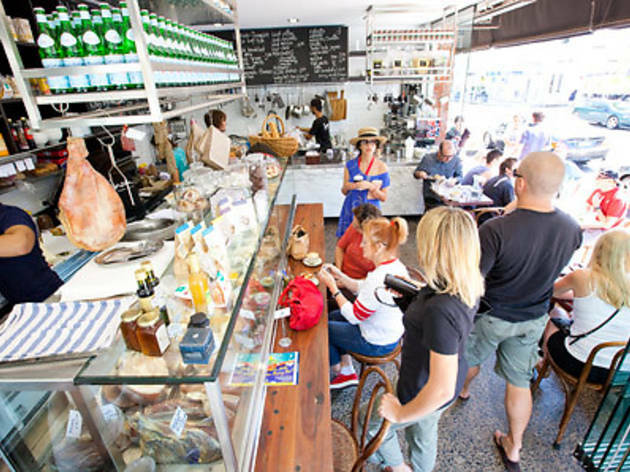 Cronulla’s Ham (Harry and Mario) is a small café whose size belies its fan base. If size matters, then Harry and Mario Kapoulas didn't get the memo. This tiny café makes the most of a small space and serves a steady stream of regulars. The two brothers, who have eight years of coffee experience between them, saw a gap in the market and decided to set up shop right around the corner from Cronulla Beach. It was a good call – Ham seems to have garnered a big following. And no wonder – it's coffee central, here. Harry is the head barista and churns out a steady stream of smooth, creamy coffee. They serve their own ‘Ham' blend, created by world barista champion Paul Bassett, which you can also buy after you try. All your faves are on offer – iced drinks, affogato and ristretto – and the menu is a smorgasbord of interesting deli offerings. Take the deli brekky plate – it features ricotta, tomatoes, avocado and paper-thin prosciutto with toasted Turkish bread. They also do a roaring trade in panini, such as the veggie number filled with lettuce and roasted eggplant with the option of goat's cheese. Or take the Atkins approach with the beetroot and goat's cheese salad, drizzled with a light balsamic and extra-virgin olive oil. Harry and Mario's mum, Kitty, also bakes muffins: rhubarb and apple, date and almond, whatever takes her fancy. And as a nod to their Greek heritage, she also makes baklava and spanakopita. A small bench runs along the length of a domed glass cabinet, providing room to satiate more Ham fans. Diners at the bench get to ogle the massive range of cheeses housed in this igloo of dairy – taleggio, brie and parmesan, just to name a few. For cured meat lovers, there's jamon, bresaola and ham. The small space may be all sleek lines and shiny surfaces, but the modern interiors house old-fashioned charm – Harry and Mario see the same people come through every week and greet them like old friends. 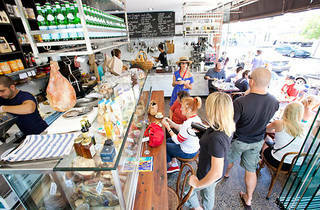 For a warm welcome, fantastic coffee and treats for your pantry, Ham is just the place.